The Excel NPV function has the syntax shown below. The Excel NPV function is used to calculate present value of a series of cash flows for a given discount rate in time value of money calculations. The cash flows do not have to be the same, but must occur at the end of a period. The discount rate is the rate for a period. The NPV function is used instead of the PV function when the cash flows each period are unequal. The Excel NPV function can be used to calculate the net present value of an investment project. Despite its name, the Excel NPV function calculates the present value of the cash flows starting at the end of period 1, it does not include the original investment at the start of year 1 and so does not calculate net present value. To calculate net present value the original investment must be deducted from the answer given by the Excel NPV function. It should be noted that the original investment is negative as it represents a cash flow out. 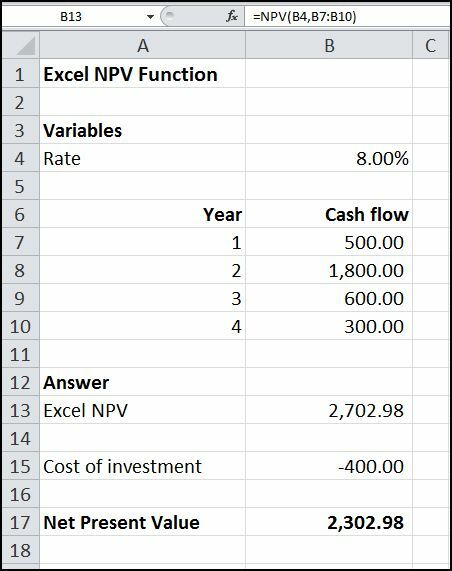 The Excel NPV function can be used with positive or negative values, for example had the cash flow in year 3 above been a cash flow out rather than a cash flow in, then the present value of the cash flows would be given by NPV(8%, 500, 1800, -600, 300) = 1,750.38. Excel is at its most useful when the arguments can be varied without having to enter the Excel function each time a calculation is made. To do this a simple spreadsheet can be set up as shown below. In this example spreadsheet, the variable arguments are entered in cells B4 to B10, and the Excel NPV function is entered at cell B13 as =NPV(B4,B7:B10). Note that the Excel NPV function could equally well be written as =NPV(B4,B7,B8,B9,B10). By changing any of the variables in B4 to B10, the present value of the cash flows can be recalculated without having to enter the Excel NPV function each time. It should be noted that if a cash flow is zero it has to be entered as zero (0), it cannot be left blank otherwise the Excel NPV function will return the wrong answer. To complete the calculation of the net present value, the original investment at the start of year 1 is entered at cell B15, and cell B17 is used to deduct this from the present value of the cash flows in cell B13 to arrive at the net present value of the project. The Excel NPV function is one of many Excel financial functions used in time value of money calculations, discover another at the links below.